East Los High 3 stars Carlito Olivero and Alexandra Rodriguez made a pit stop on their press tour in Miami and hung out with Press Pass Latino to dish about their characters on the show, what it was like to work with new cast member Cristina Milian and what fans can expect from the new episodes. For Rodriguez, flying to Miami was extra special because the East Los High star was born and raised in South Florida. Though she now resides in Los Angeles, she admits to missing Miami’s beautiful weather as well as being close to family. However, Olivero, a Chicago native, told us he was just as excited to make his way to the magic city. 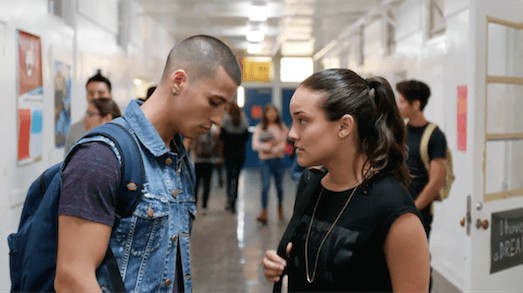 East Los High Season 3 features Carlito Olivero as “Eddie” and Alexandra Rodriguez as “Gina”, two Latino high school students making their mark at L.A’s East Los High. “It’s been an extremely amazing experience shooting Season 3 of East Los High and we couldn’t be more excited to be able to share our hard work with fans,” said Rodriguez. “Yes, it’s definitely been exciting to work on set and be able to be surrounded by such great talents because it really pushes you to work harder and keep taking the work to the next level,” added Olivero. The pair admit that their characters “get a lot closer” this season and though they don’t want to give away any spoiler alerts, they warn fans they can expect some pretty racy scenes. Actors Carlito Olivero and Alexandra Rodriguez open up to Press Pass Latino about their roles in Hulu’s East Los High 3. About working with Cristina Milian, Olivero and Rodriguez, said it was a pleasure and that though they didn’t film many scenes with her, since most of her scenes took place alongside costar Vanessa Vasquez, they considered her energy amazing and think of her as being “awesome”. For more entertainment news and exclusive video interviews follow Press Pass Latino on Youtube and subscribe!